I will re-pot it this year, since it has begun to outgrow its original one. I get to enjoy this pretty sight every day, thanks to one or both of the Generous R’s. I think it was R, but it could have been R. I’ll have to ask their mother. I found a possibility for my Retreat New Beginnings project right in my stash. This is 800 yards of Blue Moon Seduction, which is Merino and Tencel. 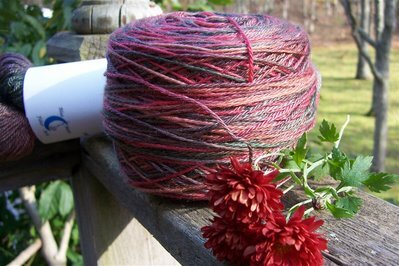 The color is “Red Oak.” The photograph doesn’t do justice to the reddish-greenish lustrous beauty of this yarn. Tencel is delightful stuff. I haven’t knitted with it before, but I had a nice time playing with it this morning. I might like to make a shawl. I swatched the “Tilting Block” pattern from Barbara Walker’s Second Treasury. Yes, I know it’s the same stitch used for the Fleece Artist Sea Silk Storm Water Shawl and the Scarf Style Midwest Moonlight Scarf. I was a smarty and I figured it out, and I’m quite pleased with my clever self! It’s Toulouse-Lautrec. This is the lightest and brightest month so far, too! Thanks for letting me play, Deb. The Retreat To-Do List hasn’t grown much, but it hasn’t gotten any smaller, either. There’s still time before Thursday morning. I’m feeling better after my looooonnng Saturday, the one that began just after 4:00 am. I could use a little nap, though. Hmmm… yawn… Annabelle’s having one… What else are cozy Sundays for? Thank you for the calendar! And, I’m so jealous. My Christmas cactus hasn’t bloomed in YEARS . . . I think that a scarf in that seduction colorway will be lovely.I’m going to have to try and get myself a copy of the Barbara Walker books. They just keep popping up all over the place.Have a wonderful time at the KR retreat – and yes, your cactus is most beauti-mous! 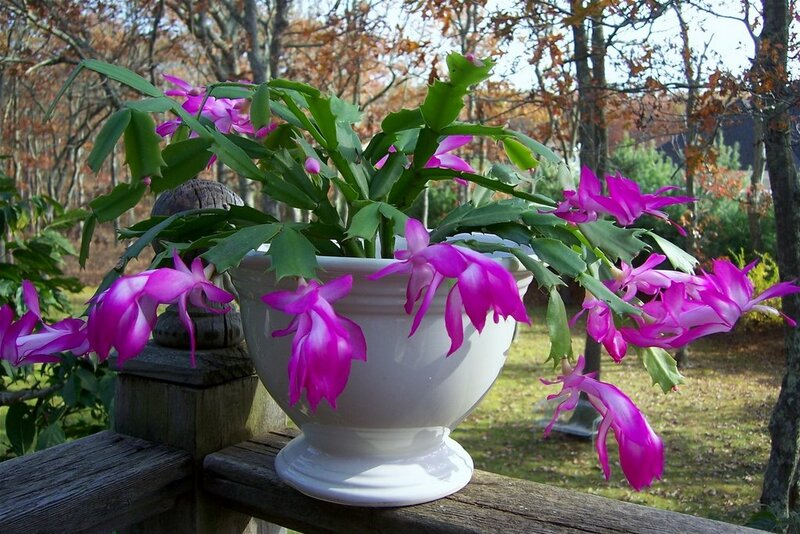 Hi Jane…I think instead of a “Christmas” cactus you have a “Thanksgiving” cactus. I have one and it’s faithful every year to bloom just before the Thanksgiving holiday, and sometimes at Easter as well. 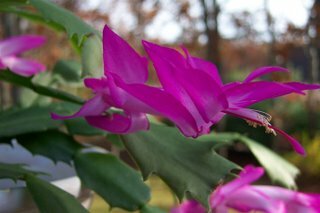 I have another cactus that came down from my great-grandmother that truly blooms only at Christmas. I treasure it as it’s the only start left from the original plant, as the one my Mother had has died out. Jane, so nice of you to stop by my blog and comment. 🙂 I’m really looking forward to meeting you, too, because any friend of Bess’ is a friend of mine! I can’t believe I have this wonderful weekend that has dropped in my lap. Yay! 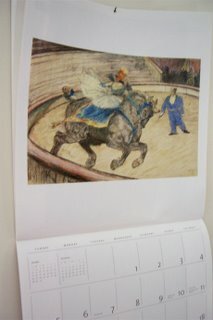 Surprisingly fun to see what people have for calendars! 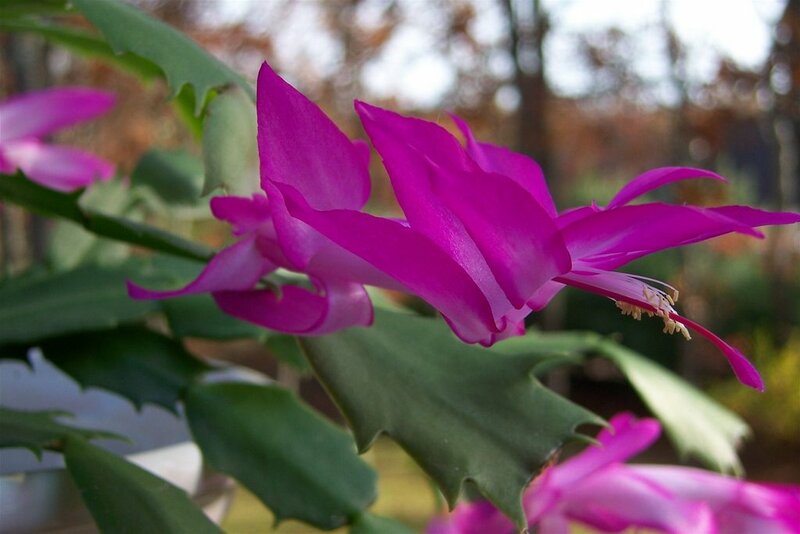 Your Christmas cactus is stunning – as is that Red Oak yarn. YUM. Have a great time at the retreat!